Detail of panel discussion, "The Practice of Engineering," October 9, 1956 at the Waldorf Astoria. On April 20, 2011, The Cooper Union Library announced the first searchable digital collection from the Cooper Archives: The Cooper Union 100th Anniversary Photographs. The collection gathers historic pictures from the Cooper Union's 100th anniversary celebration and makes them accessible electronically for the first time. As part of the centennial celebration, many panel discussions and public talks were organized throughout New York City to commemorate the occasion and richly documented in the archive. 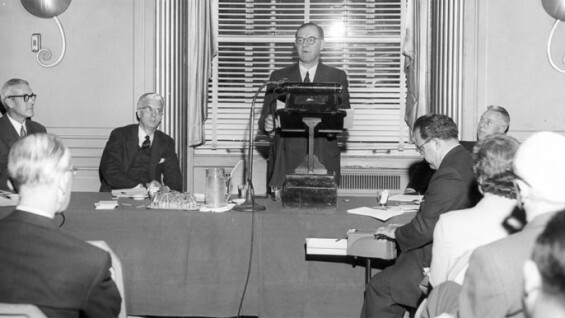 Speakers and panelists taking part included architect R. Buckminster Fuller, former President of the United States Herbert Hoover, Supreme Court Justice Felix Frankfurter, writer and urbanist Lewis Mumford, and many other notable thinkers. Without funds for additional staff, we decided that existing library personnel would take on the project as a team, even though the staffing level at the time could be best described as adequate. The learning curve would be steep, and it meant trying to squeeze more work out of the day. However, the benefits of experience gained as well as the promotion and visibility for the Cooper Archives and the Library in general outweighed the costs.